Miguel Bernas has been featured in print, television and online over the years as an authority in the digital media & marketing industry in Asia Pacific and spokesperson for brands like Nokia, MTV, CNBC, Yahoo!, Singtel, PayPal and Mediacorp. 27 February 2019 – “Miguel Bernas joins Black Marketing as CMO” published in Marketing Interactive. 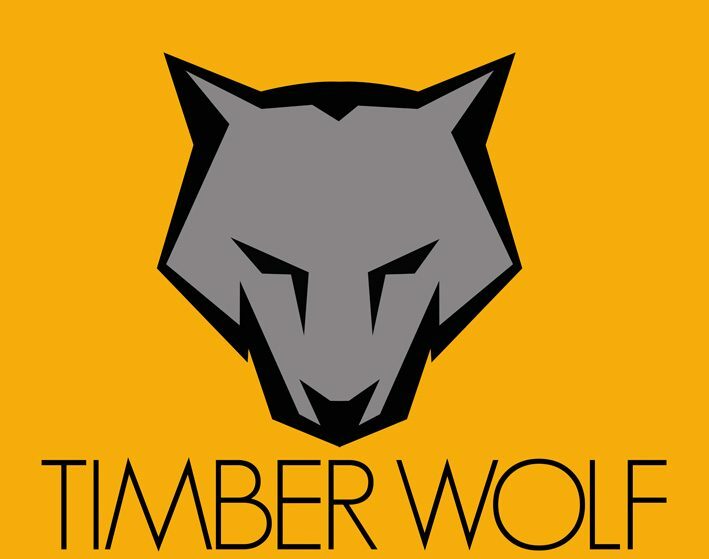 27 February 2019 – “Former Mediacorp marketer Miguel Bernas joins Black Marketing as CMO-at-large” published in Mumbrella. April-June 2018 – Article “What Brands must learn from the Entertainment Industry” published in The Singapore Marketer. 27 March 2018 – Interviewed for “Digitalisation: Behind the Semantics” on cultural and digital transformation in HRM Asia. 27 February 2018 – Writing about the rewards of mentoring for the BBN TImes. 26 January 2018 – Featured for mentoring students in Nanyang Technological University’s Peak programme in the publication, Hey! 26 December 2017 – Interviewed for his thoughts on Content Marketing by That Content Guy. 7 December 2017 – Quoted in “Competition for talent will be the biggest challenge for Singapore services companies in 2018” in Networks Asia. 1 December 2017 – Discussing digital and cultural transformation at a panel discussion, published in Human Resource Management Asia. 30 November 2017 – Listed among the newly appointed board members of the Asia Content Marketing Association in Marketing Interactive and Mumbrella. 28 November 2017 – “Miguel to Exit Mediacorp” in Marketing Interactive. 20 November 2017 – “Getting your consumers to choose your brand time and again” in Marketing Interactive. 2 October 2017 – Interviewed on Content Marketing lessons from Hollywood for Click2View’s podcast. 4 September 2017 – Quoted in “Short-form video: The next big thing in digital marketing” from TechWireAsia. 14 August 2017 – Announced as part of the speaker lineup for Mumbrella 360. 10 August 2017 – Arguing for long form brand content in “Why your ads don’t always need to be short and sweet,” from Marketing Interactive. 26 July 2017 – Panelist on “Winning new audiences” at the Global News Forum in Singapore. 2 May 2017 – “What brands should consider when selecting an influencer” published in Marketing Interactive. 12 April 2017 – Discussing brands and influencer marketing at Content 360, as featured in Marketing Interactive. 5 August 2017 – Mediacorp’s #ThisIsUs campaign feautured in Marketing Interactive. 5 January 2017 – My article “Why Gen-Xers mourn their idols more than any other generation” published in Esquire. 25 February 2016 – “Miguel Bernas joins Mediacorp” in Marketing Interactive. 1 February 2016 – “Promote the most important brand of all: Your own” in Marketing magazine’s “The Futurist” issue, print and online editions. 15 December 2015 – Listed among LinkedIn’s 10 Most Engaged Marketers in 2015, featured in Marketing Interactive and Enterprise Innovation. 4 December 2015 – Departure from PayPal covered in Mumbrella and Marketing Interactive. 2 October 2015 – Coverage of IAB Content Conversations event in Mumbrella. 30 September 2015 – Acknowledged in the book Managing Online Reputation: How to Protect your Company on Social Media by Charlie Pownall. 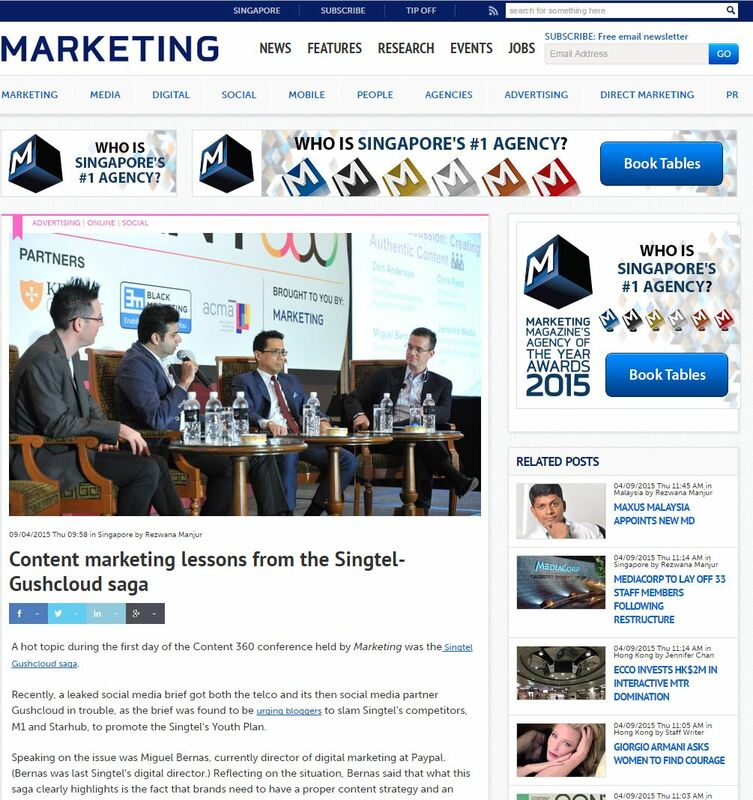 9 April 2015 – Coverage of “Authentic Content” panel discussion at Content 360 from Marketing Interactive. 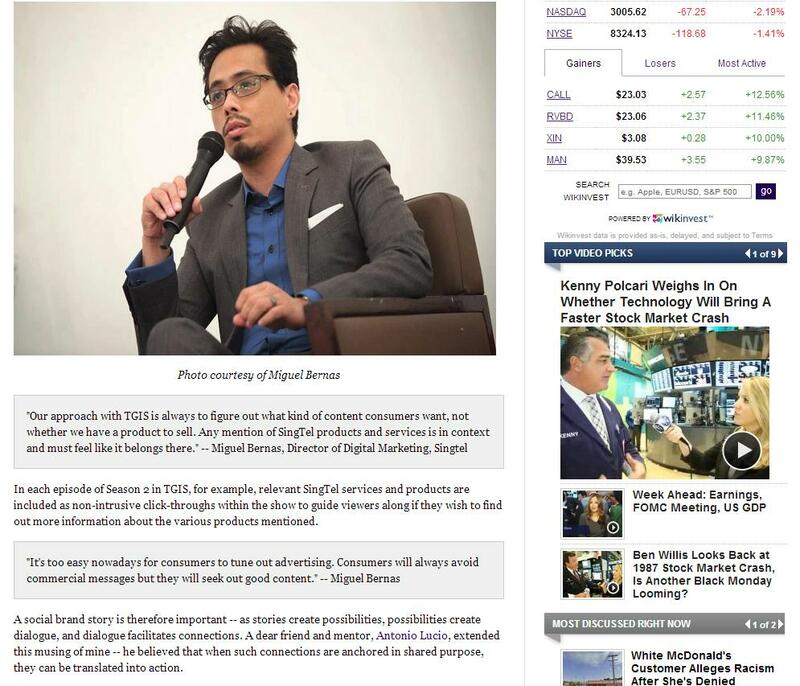 5 June 2014 – “Miguel Bernas joins Paypal” covered in Campaign Asia and Marketing Interactive. 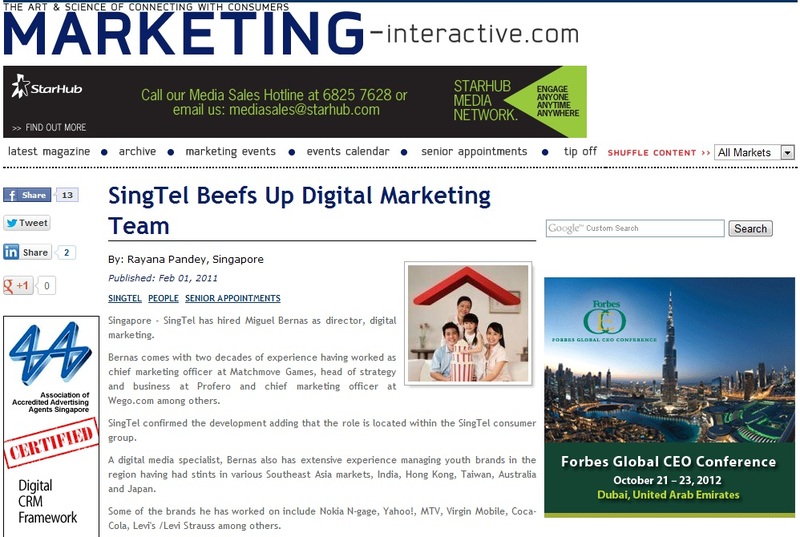 15 May 2014 – “Miguel Bernas to leave SingTel” published in Campaign Asia. 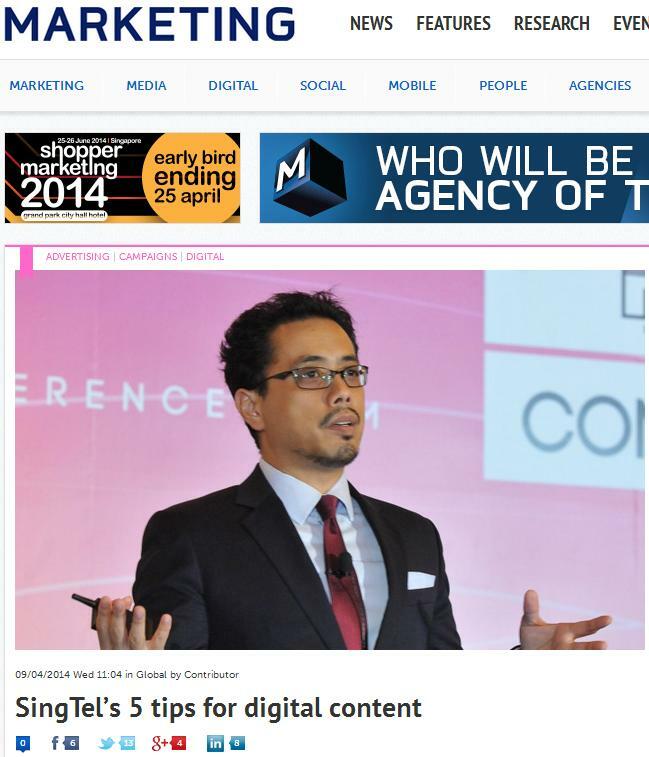 8 April 2014 – “Singtel’s 5 Tips for Digital Content” published in Marketing. 9 January 2014 – Mentioned in an article about LinkedIn profiles in Mumbrella. 2 December 2013 – Interviewed on branded content, published in Campaign. 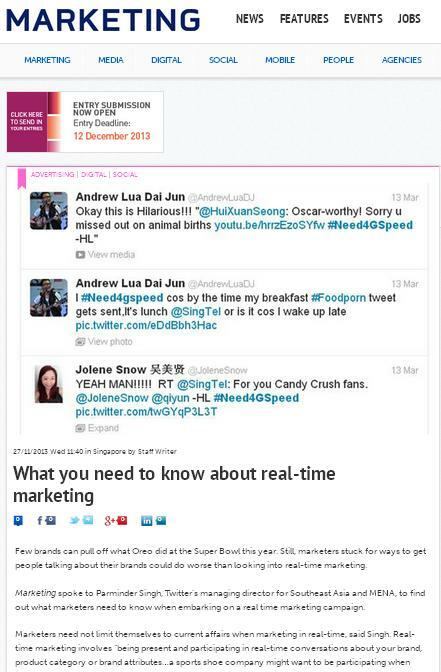 27 November 2013 – SingTel’s #Need4GSpeed cited in an article on real-time marketing in Marketing. 12 November 2013 – Thanks to campaigns #HawkerHeores and #Need4GSpeed, SingTel wins Marketer of the Year at Marketing magazine’s Marketing Excellence Awards 2013. 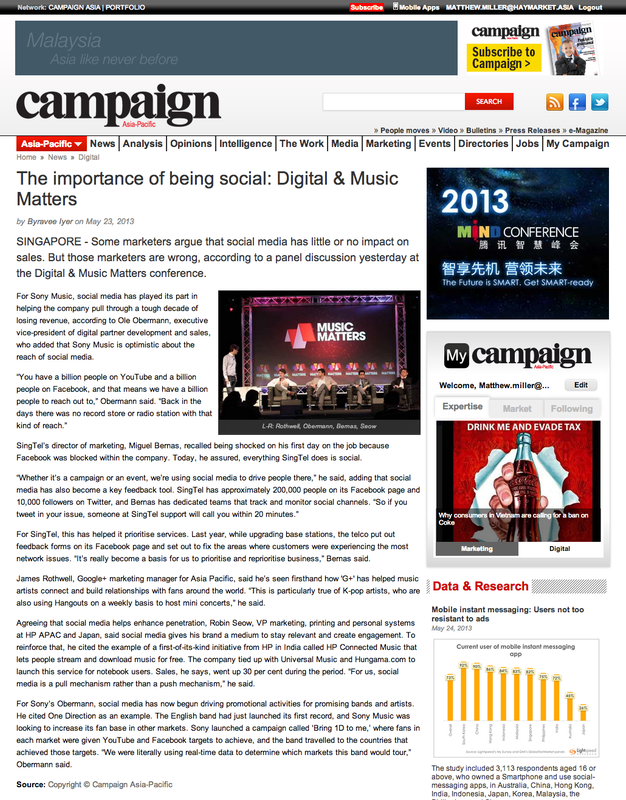 16 September 2013 – Discussing SingTel’s success formula for social media and content at Spikes Asia 2013, published in Campaign. 10 September 2013 – Weighing in on NTUC Fairprice campaign controvery, published in Campaign. 14 June 2013 – SingTel’s #Need4GSpeed Twitter campaign is featured in the article “Make Your Brand Story Meaningful” published in the Harvard Business Review. 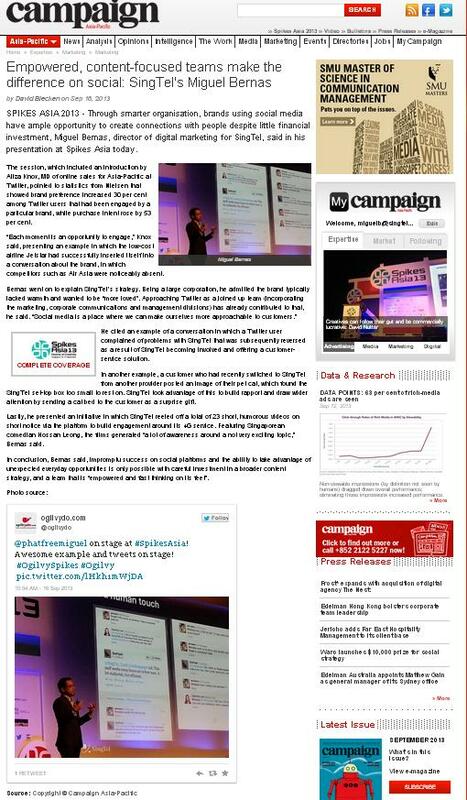 14 June 2013 – Miguel shares SingTel’s Twitter campaign case study at Ad:tech Singapore 2013, as covered by Digital Market Asia. 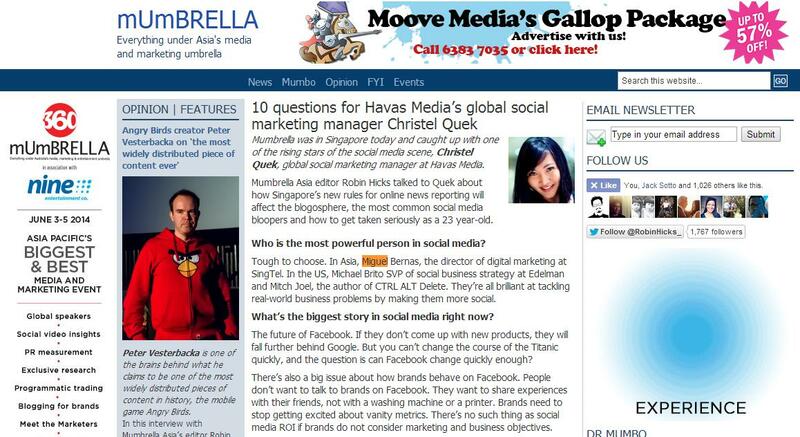 13 June 2013 – Mentioned in interview of Christel Quek in Mumbrella Asia. 23 May 2013 – Miguel comments on the importance of social media to SingTel in Campaign. 1 April 2013 – SingTel’s #Need4GSpeed campaign is featured in Adobo magazine. 21 March 2013 – The story of Singtel’s #Need4GSpeed campign. 28 January 2013 – Miguel interviewed for launch of Twitter in Singapore by Marketing Interactive. November 2012 – Miguel in “Time for Digital Integration”, Campaign Asia‘s coverage of the Digital Marketing Spotlight event held on 12 October 2012. 20 October 2012 – SingTel’s content strategy for social media is discussed in an article in the Huffington Post. 16 August 2012 – Miguel appears as part of coverage on the APPIES 2012 by Ad Asia. 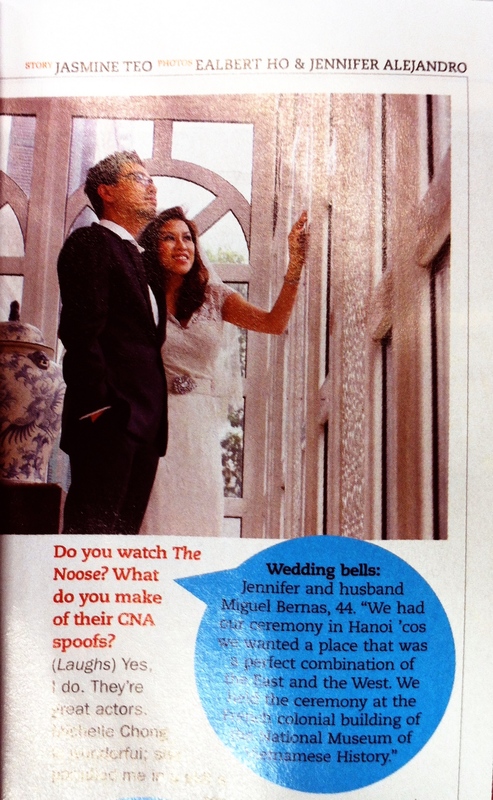 19 July 2012 – Miguel and wife Jennifer in 8 Days. 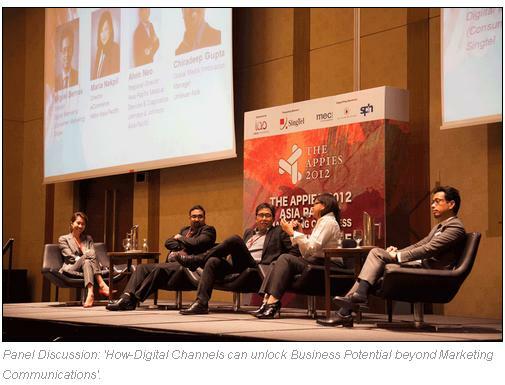 24 May 2012 – Miguel (as Director, Digital Marketing, SingTel) featured in an article summarizing key lessons from Digital Matters 2012 in Singapore (Campaign). 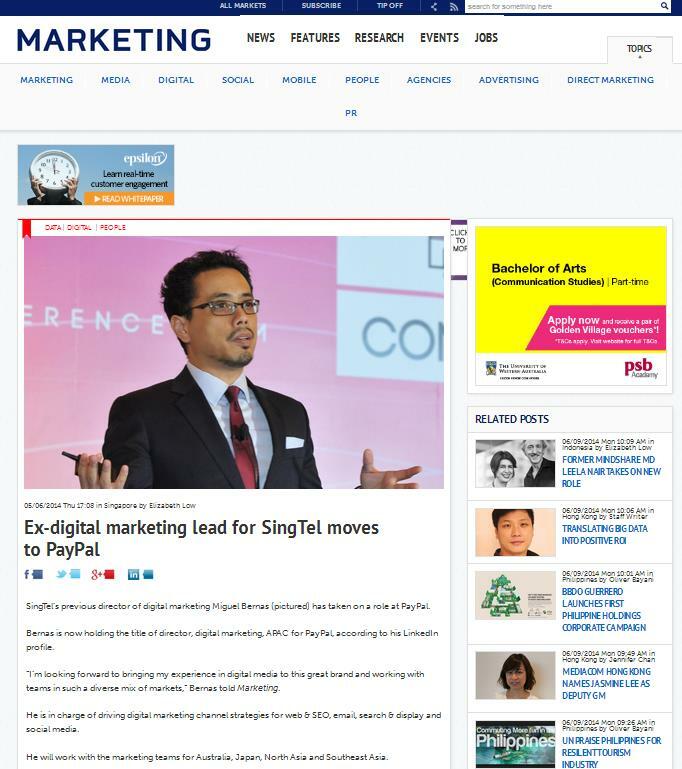 2 February 2011 – Miguel joins SingTel as Director, Digital Marketing (Marketing Interactive). 21 December 2009 – Miguel (as Chief Marketing Officer for Matchmove Games) is interviewed on Singapore’s Channel NewsAsia. 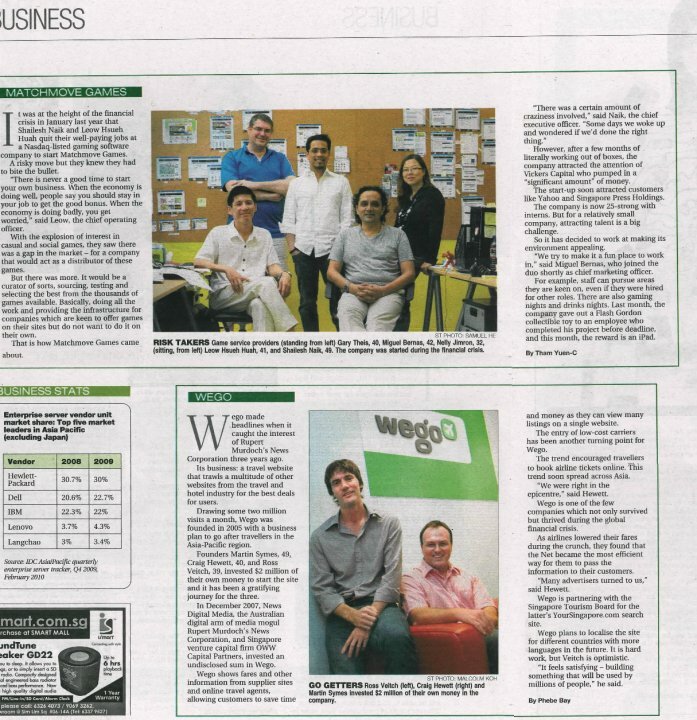 3 March 2008 – Miguel joins Bezurk.com, later re-branded Wego.com, as Chief Marketing Officer (Marketing Interactive). 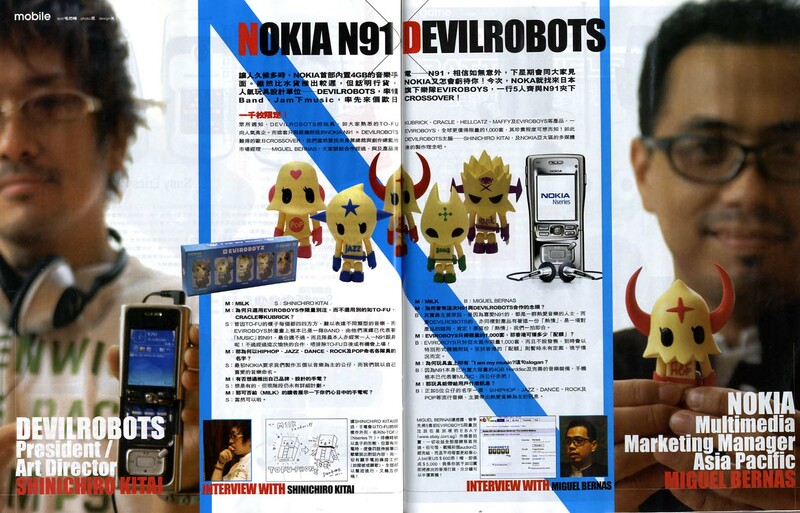 25 June 2006 – Miguel is interviewed with Kitai Shinichiro of Japan’s Devilrobots to announce tie-in with launch of Nokia N91 (Milk, Hong Kong). 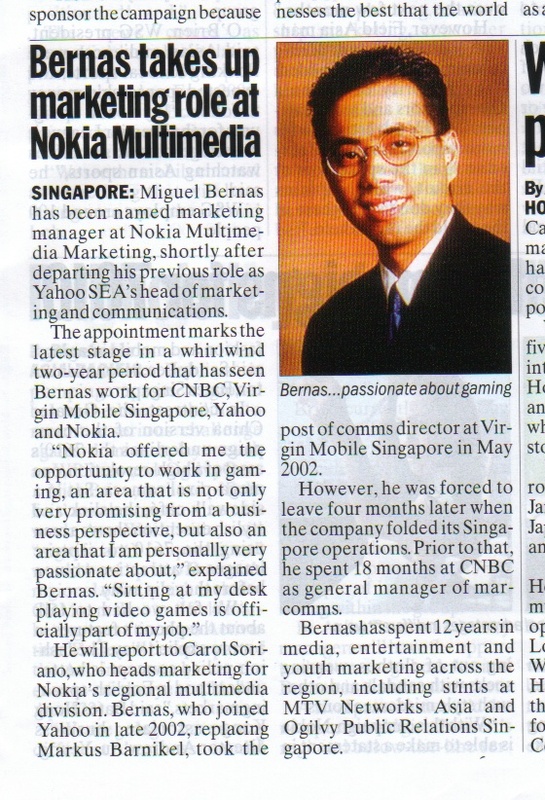 April 2004 – Miguel joins Nokia as Multimedia Marketing Manager (Marketing & Media). 11 February 2004 – Miguel (as Head of Marketing & Communications, Yahoo! Southeast Asia) discusses the popularity of online personals. 21 January 2004 – Miguel (as Head of Marketing & Communications, Yahoo! Southeast Asia) discusses how to manage spam. 22 October 2003 – Miguel (as Head of Marketing & Communications, Yahoo! Southeast Asia) discusses piracy. 3 October 2003 – Miguel (as Head of Marketing & Communications, Yahoo! Southeast Asia) discusses the rise of cameras in mobile phones. 10 September 2003 – Miguel (as Head of Marketing & Communications, Yahoo! Southeast Asia) discusses the popularity of video games. 20 August 2003 – Miguel (as Head of Marketing & Communications, Yahoo! Southeast Asia) discusses the rising usage of instant messaging. April 2003 – Miguel Bernas joins Yahoo! as Head of Marketing & Communications, Southeast Asia (Advoice). 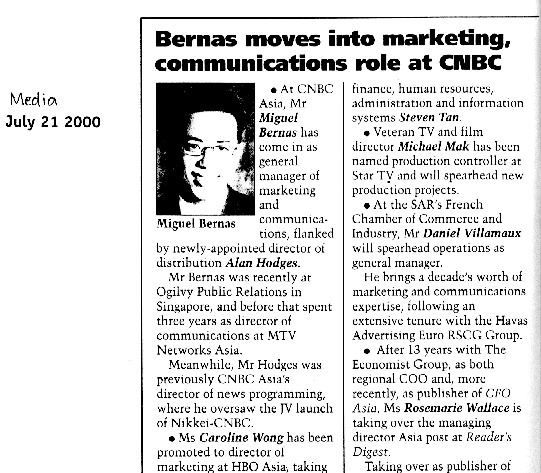 21 July 2000 – Miguels joins CNBC Asia as General Manager, Marketing & Communications (Media & Marketing).